U.S. no longer champion of human rights? 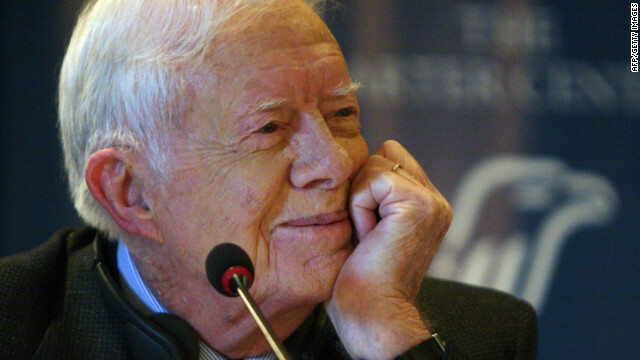 In a recent op-ed in the New York Times, former President Jimmy Carter makes the case that the United States is "abandoning its role as the global champion of human rights." While Carter makes no direct reference to President Obama, he does condemn his policies as violating international human rights which, in turn, "abets our enemies and alienates our friends." A recent poll by the Pew Research Center, which questioned more than 26,000 people in 21 countries, found that Obama's policies are hurting his global image. In particular, drones: In 17 of the 21 countries surveyed, more than half of the respondents disapprove of U.S. drone attacks targeting extremists in countries like Pakistan, Yemen and Somalia. That contrasts sharply with the opinion of 62% of Americans, who approve of the drone campaign. What do you think? How is the U.S. viewed around the world and is the use of drones helping or hurting? « Previous entryWould Turkey leave NATO? We are in the Jimmy Carter phase of the next Ronald Reagan Revolution. And it can't come a moment too soon. That depends on what you think the champion of human rights should do. If it makes a fuss when it can benefit from it, annoys, teaches everybody what to do and what not to do, supports some crooks because they have profitable business together, maintains double standards and talks like hypocrite, comes to you home without invitation and makes a mess of it – I say US is still a champion, no doubt about that! islam is a crime against humanity. Carter and Obama are "Dumb" and "Dumber." I was eating a snack and waithcng this when defied his lack of core and upper body strength came on I definitely laughed and totally spit out my food (sorry Sean's laptop). When Michael Jackson the famous pop singer who had many great songs from Pretty Young Thing and Bille Jean, which can be heard across radio stations in America and across the world. Michael Jackson had this child like innocent approach towards human rights, when people were starving in America and in Africa he listened to them just like President Barrack Obama listens to the people who raise concerns on social welfare and job creation in our great nation. To say our great nation is no longer a champion of human rights is unfair to say that, yes we are nation that cares about human right's from the Middle East to Africa because whatever happens in those places will eventual hit our shores in due course time. Like most Americans like myself who watch destruction across the world in our living room's on television while eating some popcorn, it burns me inside to think we don't give a damn about other nations when we provide lot's or resources from funding towards clean drinking water programs to food programs to third world nations. As Americans when order that cup of Starbucks coffee or stand in line for that cheeseburger at MacDonalds, we all as Americans should take a few minutes to think about a starving child in the Bronx NY, or in Tel Avi Israel who pray for better times in terms of freedom from poverty and better way of life for years to come.